Save 62% with a bundle deal! Web Design Learn what a design system is, and how to create one. Web Design Learn how to design forms with accessibility in mind. What's the difference between cloud hosting and shared hosting? Tools We fill you in. CSS These tools let you build complex layouts visually, without having to be an expert in CSS Grid syntax. Tools A fresh batch of tools you’ll want to consider for your projects. Web Design Anticipate visitors' moves and build better user experience into your sites from the start. UX Discover how focusing on objects can help you fashion a consistent UX. 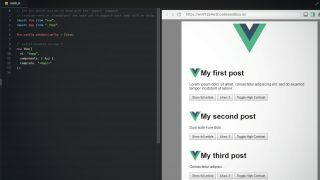 Web Design We examine the best code editors, and offer some advice on how to choose between them. Web Design Challenge your assumptions and discover what’s newly possible with layout on the web. Opinion Experts share the recent websites that have piqued their interest. Web Design … plus two wildcard predictions to watch out for.